»GE Crops»Where Do All the GMOs Go? Where Do All the GMOs Go? Genetically engineered crops were grown on about 175 million acres in 2014, covering some 43% of US cropland. The acreage is dominated by soybeans and corn, with only a few other GE crops in production including cotton, sugar beet, alfalfa, canola, squash and papaya. Where does it all go? 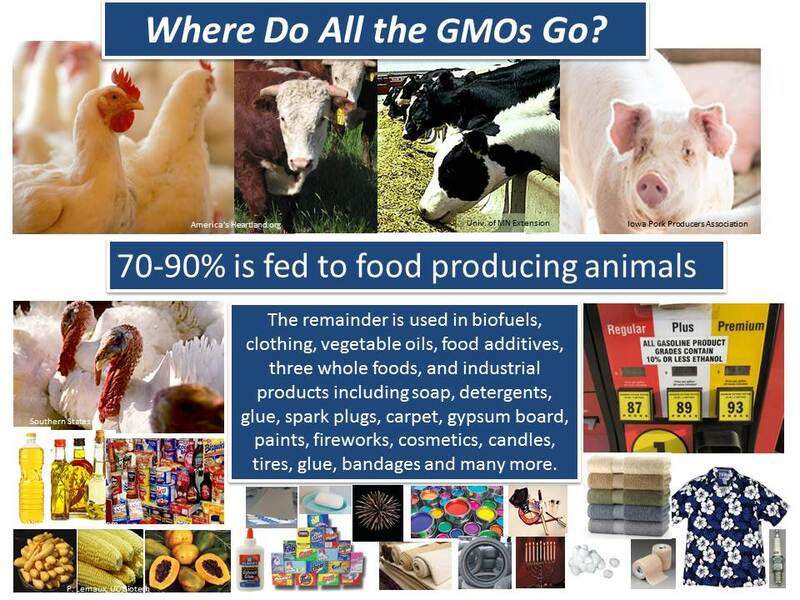 Approximately 70-90% of all GE crops are fed to the common food producing animals; chickens (broilers and layers), beef, dairy cows, swine, turkeys and an assortment of others (1). In addition to the three GE whole foods (squash, sweet corn and papaya), the remainder is used for biofuels, vegetable oils, processed food additives, clothing, home furnishings, and a wide array of other industrial products from spark plugs to soap (2). Corn and soy derivatives are components of many familiar products we use every day. With such a large portion of GE crops being fed to animals, this is clearly the place to look for any direct health effects GE crops may have, especially in comparison to non-GE crops. According to animal scientists Alison Van Eenennaam and Amy Young at the University of California at Davis, over 100 billion animals have consumed some level of GE feed between 2000 and 2011, covering the period from the rapid early growth of GE varieties to their dominance in soybean, corn and cotton acreage. A large amount of data exists on animal health and performance from 1983 to 2011, covering several years with and without GE crops, and Van Eenennaam and Young recently published a comprehensive review on the impacts of GE feedstuffs on livestock populations which included these comparisons. United States broiler statistics before and after the introduction of genetically engineered crops in 1996. From Van Eenennaam and Young (2014), figure reproduced with permission. The rate of broiler carcass condemnation (from USDA inspection) decreased significantly over the past quarter-century and was at its lowest in 2011. 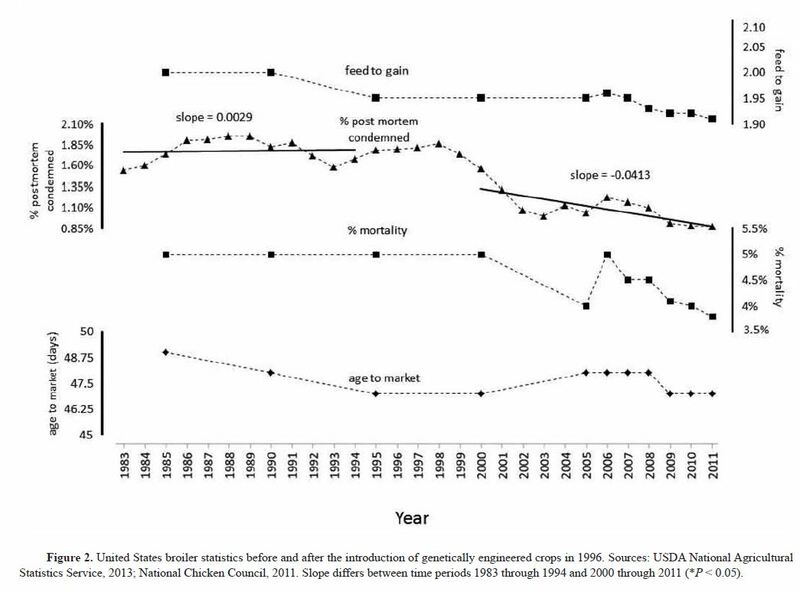 Mortality was essentially unchanged and was also at its lowest in 2011. The data set from dairy cows showed that somatic cell count (an indicator of mastitis and inflammation in the udder) decreased while the average milk yield continued to increase. Overall, their review of the publicly available field data did not reveal any negative trends in livestock health and productivity, nor has any study revealed any differences in the nutritional profile of animal products derived from GE-fed animals. Other long term and multiple generational feeding trials with several animals have reached the same conclusions. Their review also noted that since DNA and protein are normal components of the diet that are digested, there are no detectable or reliably quantifiable traces of GE components in milk, meat, and eggs following consumption of GE feed. The animals consuming GE feed sources are as healthy (or more) as they’ve been over the last 25 years, and their products are basically free of GE components, similar to processed oils and sugar from GE crops covered in the previous post. 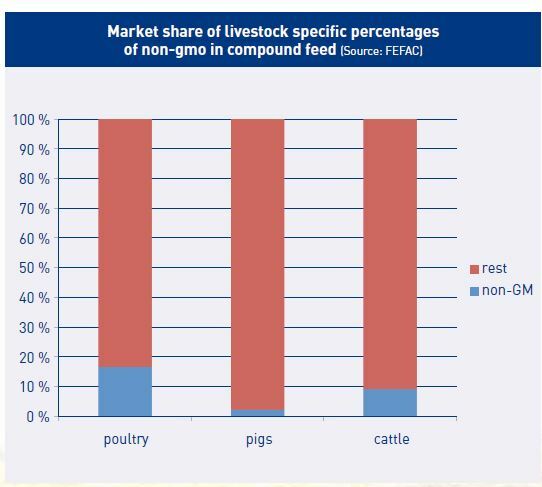 Similar to the story in the US, approximately 85% of the animal feed in the European Union (EU) contains GE material, as shown in the above graph from the European Feed Manufacturers Association. A popular misconception is that the EU bans GE crops; it has approved many of them for importation, though only a few for cultivation. The EU is highly dependent on soybean imports (millions of tons per year) for protein supplement in their compound feeds, and basically out-sources it to countries in North and South America which grow and supply most of it as GE soybean. The GE soy comes into the EU labeled as such, though the eventual animal products are not labeled. The reason is that the European Food Safety Authority concluded that a large number of experimental studies with livestock have shown that recombinant DNA fragments or proteins derived from GE crops have not been detected in tissues, fluids or edible products of farm animals, so what’s to label? They also noted that no technique is currently available to enable a valid and reliable tracing of animal products (meat, milk, eggs) when the producer animals have been fed a diet incorporating GE material. The corn starch incorporated into the porcelain part of a spark plug very likely (>90% chance) is from GE corn, but we are not concerned or even aware of it. Likewise with the alcohol and diesel in biofuels originating from GE varieties of corn, soybean or canola. The other industrial products use GE crop derivatives which have been chemically or physically processed in ways that leave no trace of the methods of plant breeding used in their development. This is also the case with animal products, oils and sugar from GE crops, and the products are equivalent in composition to their non-GE counterparts. When one looks carefully at where GE crops go after harvest, only a small amount is actually for our direct consumption. Remaining concerns about the safety of GE crops should then focus on these few, which will be addressed here in the near future. Feedback and suggestions for improvement are appreciated! (1) Flachowsky, G., H. Schafft, and U. Meyer. 2012. Animal feeding studies for nutritional and safety assessments of feeds from genetically modified plants: A review. J. Verbraucherschutz und Lebensmittelsicherh (Journal for Consumer Protection and Food Safety). 7:179–194. Subscription or per article payment required. (2) Sources: Novozymes, NC Soybean Producers Association, Iowa State University Soybean Extension and Research Program, GMO Compass, Kentucky Corn Growers Association, Forbes, Wall St. Cheat Sheet, Agriculture Corner, Purdue University Department of Agronomy, National Corn Growers Association, JH Hawes Grain Elevator and Museum. FEFAC 2013 Congress, The Feed Chain in Action, The non-GMO feed market. Ricroch, A. E. 2013. Assessment of GE food safety using ‘-omics’ techniques and long-term animal feeding studies. N. Biotechnol. 30:349–354. Subscription or per article payment required. ← Which Crops are Genetically Engineered?